Gift of Alfred Morris in memory of Alfred Morris Sr.
Gilbert Stuart, who grew up in nearby Saunderstown and Newport, Rhode Island, is considered the preeminent portraitist of the Federal Period. A prolific artist, he painted over 1,000 likenesses in his lifetime, including those of the founding fathers and other prominent citizens. Stuart was known for eccentric and capricious behavior, often keeping unfinished paintings in his studio for years. He began his portraits of Salem merchant Humphrey Devereux and his wife Eliza in September 1817. At nearly thirty-two years old, Eliza Dodge Devereux (1785–1828) was an invalid when she and her husband sat for the famous artist. Stuart masked her ill health behind a healthy glow and painted her with short hair, fashionable at the time. While Eliza greatly appreciated Stuart’s portrayal of her countenance, according to an early source, she was dissatisfied with Stuart’s indifferent treatment of her clothing. Eliza dared not approach the temperamental artist with her concerns, however, for fear that she would never receive the painting. Stuart finally delivered it in 1821. 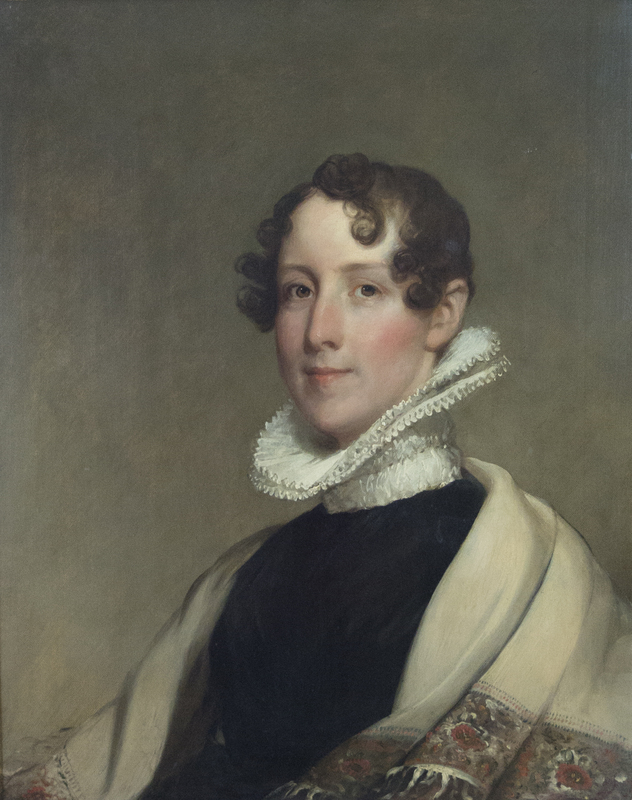 A handwritten note on the back of the portrait dating to before 1897 states that well-known American artist Chester Harding (1792–1866) repainted the ruff and drapery in July 1835, seven years after both Eliza’s and Stuart’s deaths.